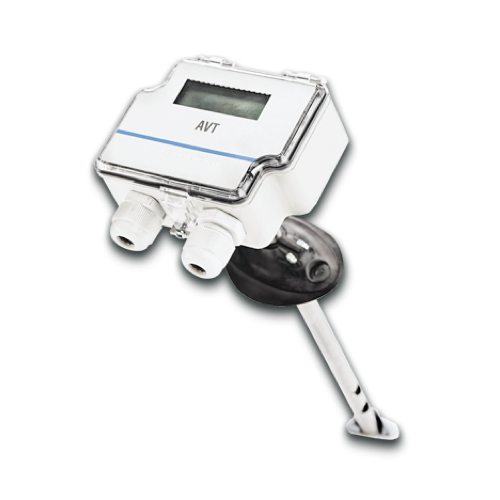 Multi function Air Velocity and Temperature Transducer AVT with LCD display, field adjustable relay, 3 ﬁeld selectable measurement ranges for air velocity, selectable via jumper. Multi function Air Velocity and Temperature Transducer AVT is widely used for measuring and controlling the speed and temperature of the air flows in air conditioning, air quality systems and industrial hygiene. The Air Velocity Transducer AVT is engineered with LCD display, ﬁeld selectable range and output options in a single device; it’s designed with a duct mount probe and adjustable collar suitable for round or rectangular ducts. The collar allows incremental adjustments to the insertion depth, enabling fine-tuning of measurement results to conform test and balance data.